Anyone out there heard of Initial Outfitters? I hadn't until a friend of mine started thinking about selling it recently. She hosted a party at her house and all the ladies gathered around a table of jewelry, purses, soaps, and scarves. The catalog is pretty extensive and there are several pieces I'd like to own. Unfortunately this party was thrown after my Black Friday shopping and I wasn't in a place financially to put a lot of money into myself this time of year. I did however purchase one item. 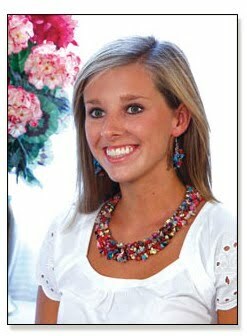 This multi strand bead bib necklace and matching earring set. I LOVE the earrings. I could see myself wearing them all the time. The necklace seems more summer appropriate to me...like it was mean to be worn with a strapless dress or tube top. It looks very heavy on me so I'll have to play around with it to figure out how it will look best. The quality is nice and the colors are beautiful. I bought the set for $32 which seems very reasonable compared to what I've seen at some local boutiques. I can't wait to get another catalog maybe next year I'll be more prepared to shop for myself.